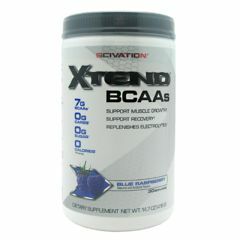 AllegroMedical.com presents The Scivation Xtend - Raspberry Blue Amino Acid Supplement. Intra-Workout Catalyst. Enhances muscle building and strength. 7G BCAAs – 2:1:1 proven ratio. Increases fat burning. Helps speed recovery. Zero sugar or carbs. Maximize training intensity and promote optimal muscle protein synthesis and recovery with Scivation Xtend: Stimulate and support muscle protein synthesis and provide metabolic energy with research-validated 2:1:1 ratio of Leucine, Isoleucine, and Valine, the branched chain amino acids (BCAAs). Support higher training volumes by facilitating rapid ATP turnover and lactate reabsorption. Ensure optimal BCAA aminotransferase reactions by delivering the rate-limiting cofactors. Optimize cell hydration and muscular contractile function, especially under brutal training conditions by employing hypercritical and vital electrolytes.